65th Street Cocktail. Oil on panel, 12" x 12". Like a few other paintings for this book, the first effort or two didn't quite hit the mark. But deja vu smacked me upside the head as I started this post. Then it dawned---the first painting is already posted here. Awkward-ish. 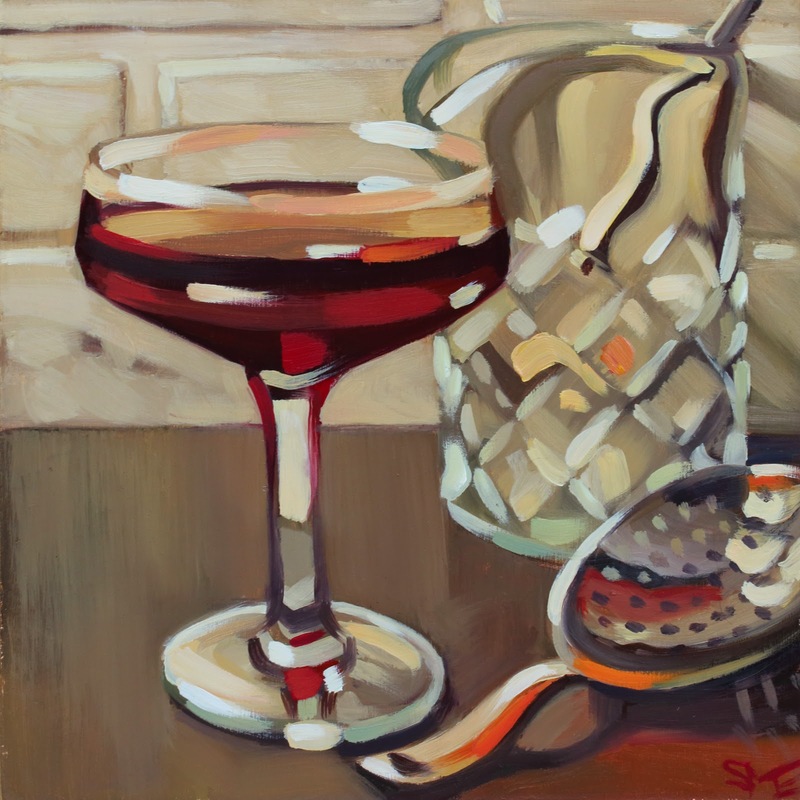 But this was the first drink I painted for Mixology With a Twist, and it had not occurred that I would get so damned picky. So much happier with this one! I imagine it as Curtis Day's view as he makes his signature cocktail at Casper Fry. Oddly, I didn't tell the story of this drink in the original post. The night we met Curtis, he told us that his girlfriend lived on 65th street in NYC. But the very next day, she was moving here and they would be together. So cool! Happy for him, happy with the final piece. Joy. Between the Devil and the Deep. Oil on panel, 8" x 8". Between the Devil and the Deep is the first original Kristi Gamble drink I ever tasted. It is also one of the most beautiful drinks I have seen. 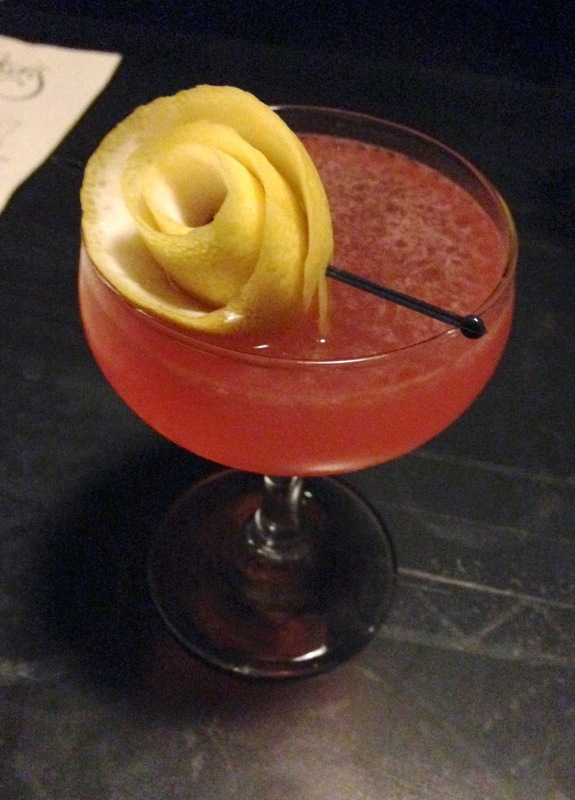 The lovely coral color combined with Kristi's gorgeous lemon rose garnish are stunning. I didn't do it justice, but gave it my best three tries. If I had a job which required making lemon roses all night, I would be fired. It's so much tougher than it looks! As I collect recipes from around the Northwest, I'm finding that Spokane bartenders are much kinder in their use of ingredients. That is to say, they use (mostly) things I can actually get without a road trip or an operating loan to cover shipping costs. This drink took a little extra effort, but it was a) not that difficult, and b) worth it. Rhubarb bitters came from Pearl Specialty in Portland, and I made my own Falernum. Falernum---a syrup made with cloves, almonds, ginger, lime, sugar and rum---is my new obsession. Here is the recipe. And here is a photo of Kristi's beautiful lemon rose. Golden Stonefly. Oil on panel, 12" x 12". Back in the groove, for a bit, at least. This piece was fun. Golden Stonefly is a drink invented by bartender Kristi Gamble, currently at Durkin's Liquor Bar in Spokane. She created it at the request of Spokane's own Dry Fly Distilling to showcase their award-winning vodka. 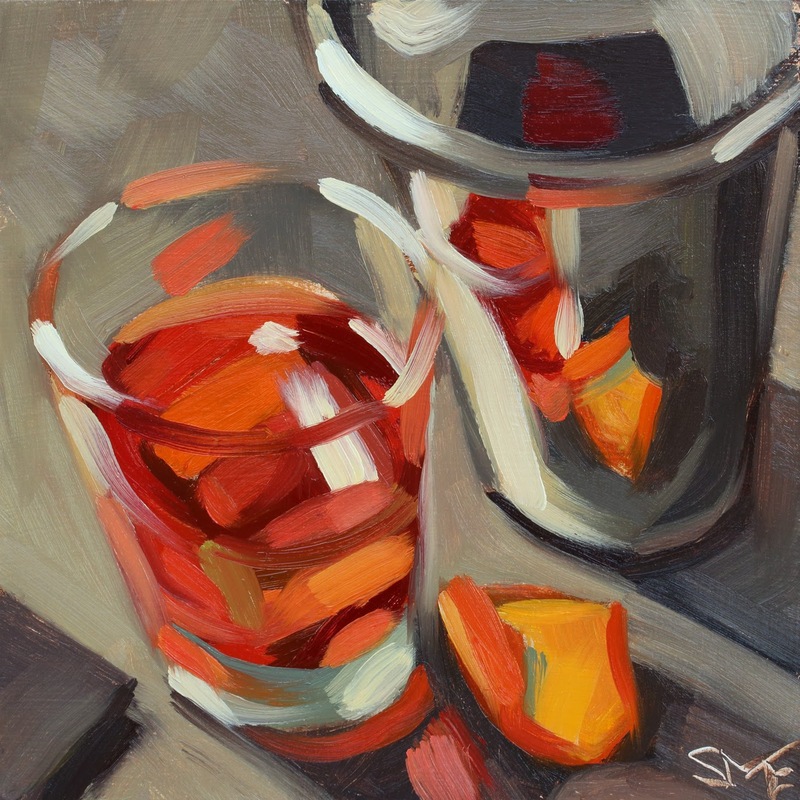 The last set of paintings for the vintage cocktail book proved enjoyable due largely to fun deco patterns and old barware. Conveniently, many new cocktail bars have an old-school look, so I can still get out my vintage yah-yahs. Durkins, for example, is all flocked wallpaper, subway and hex tile, antique-looking coupes and chandeliers. As with all the book paintings, this one is reserved for a book release exhibit this fall. 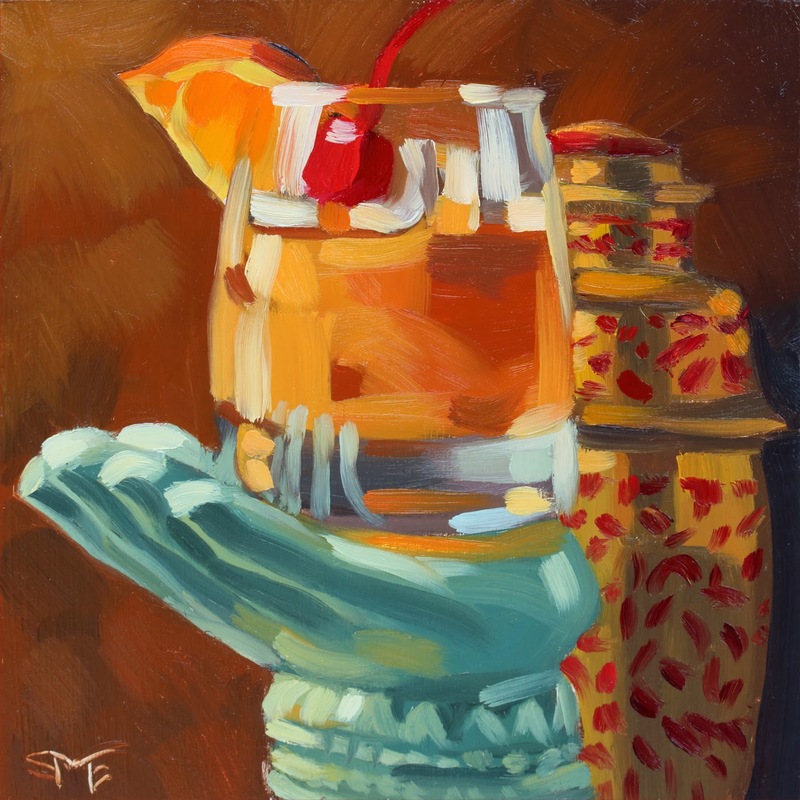 But there are similar paintings available now on Daily Paintworks. Tamarind Whiskey Sour. Oil on panel, 12" x 12". I had my first tamarind whiskey sour at an Indian restaurant in Portland, Oregon a year or so ago. Mixology (the project) didn't exist yet. It was so delicious, though, that later I looked for a recipe online. I found one on Bon Appetit's website, and noticed it was contributed by someone in Portland. That someone, it turned out, was chef Andy Ricker, owner of Portland's famous Pok Pok Thai restaurant. It was this drink that gave me the idea to start a second book of original recipes and twists on classics from the Pacific Northwest. I contacted Pok Pok, and they were kind enough to give me permission to use the recipe. A few weeks ago I went to the source and had the drink at Pok Pok's bar, looking for inspiration for the painting. But this painting had been swirling around in my head for a while, and I already knew what I wanted to put in the painting. So in went the statuary Buddha hand and brass shaker, even though Pok Pok is modern and non-traditional. But hey. Their recipe, my painting. Below is the 6" x 6" sketch that brought me out of my painting funk. It's for sale at Daily Paintworks. Tamarind Whiskey Sour Study. oil on panel, 6" x 6". Sold. November Rain. Oil on panel, 8" x 8". NFS (yet). November Rain is the very first recipe I was given for my second Mixology book. I had just received the first shipment of Mixology #1 and was waiting for the release party, when I saw a news article about Curtis Day, bar manager at Casper Fry. Casper Fry is four blocks from my house, but I had only recently discovered their great cocktails. As luck would have it, we ended up there that night. I wanted to try the November Rain, a drink Curtis had invented that was mentioned in the news story. I had never met Curtis, but it turned out he already knew about my first book project. Not only did he make the off-menu drink, he offered that recipe and more. Curtis has since become my unofficial advisor, and I his mixology guinea pig. I should mention that I LOVED the November Rain. So much so that I painted it three times before even remotely doing it justice. Above, the charmed number three. Velvet Aviator. Oil on panel, 8" x 8". Still dusting off a few cobwebs, but things are definitely looking up! There is seriously no substitute for daily painting. Back in college, my painting professor always said, "get some licks in every day." It only took me twenty-six years to realize just how right he was. Time away from the easel makes the process seem distant and intimidating. Time at the easel starts the flow, and work begets ideas. 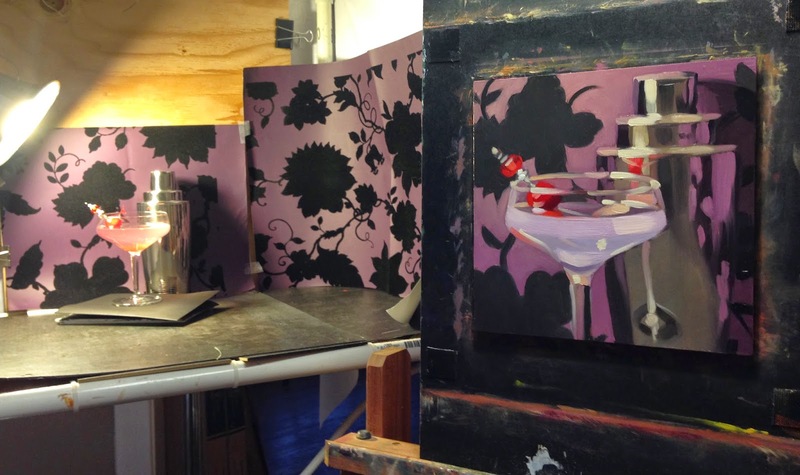 Although this piece is not for Mixology With a Twist, I figured out how to do one of the book paintings as I painted it. Look for a study for that one tomorrow. Meanwhile, here's a fun shot I took at the easel during Velvet Aviator. Red Rocks. Oil on panel, 5" x 5". $75. Daily painting number two: quick and tiny! I ran out of 6" x 6" panels, which may have been the best thing that could have happened. Smaller = quicker = looser = fresher. The higher viewpoint is fun, too. I've been meaning to start playing with perspective. Starting to feel a bit warmer at last! Ahhh! Cosmo-Poppies. Oil on panel, 6" x 6". Wow. I have been knocked so hard out of my groove, my head is spinning. Starting in December, a series of events so foul, so utterly distracting, left me wondering if I even remember how to paint. First, trouble with a big commission led to a bloody eye (stress) and then the flu for the holidays… then a few false starts on Mixology illustrations… then the discovery that I have been the victim of artistic identity theft sucked another week or two away and led to another cold. Enough! Before starting work on Mixology #1, I did daily paintings for a month to get warmed up for the real deal. I guess that is how it will have to be again. So above is my first daily painting, Cosmo-Poppies. At least, during the grim painting hiatus, a fat packet of flocked wallpaper samples arrived from Design Your Wall.com. I'm in love with the giant purple poppies! To the easel, and onward.